The Best Neapolitan Pizza in North Van? If you live in North Van, you’ll be especially excited to learn there is an absolutely fantastic four-month old pizza joint on East 2nd just off Lonsdale called Il Castello. 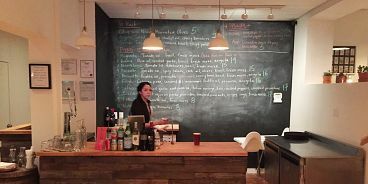 Run by Francesca Galasso, a pizza-loving first generation Italian, you can bet this is authentic Neapolitan pizza — you know the kind that’s ultra-thin crust, extra saucy and super droopy when you pick it up? The restaurant itself is pretty spacious with a beautiful white-and-black tiled, wood-fired oven, set in the corner of the open kitchen. Order off a chalkboard menu at the front counter, then seat yourself and wait for your pie to arrive. Choose from 10 creations, a handful of which are traditional Neapolitan-style, the others cater to the Canadian palate, meaning a little more variety in the toppings department. I tried one of each — the classic Margherita and The Zucca, which was topped with butternut squash, pancetta, toasted pine nuts, fresh mozzarella and, the piece de resistance, crispy fried sage. Both were irresistible, and despite my purist beliefs, the zucca was a real treat. Highly recommend.